From do-it-yourself, to professional, to industrial applications, Goodyear delivers. 100% made and assembled in the USA, the Goodyear Rubber Air Hose is built to perform and backed by an industry-leading 10 year guarantee. Specially-formulated rubber construction meets RMA Class "C" oil resistance and exceeds RMA 4:1 safety factor (burst/working pressure ratio). With a broad -40 F to 190 F working temperature range, it works comfortably and remains flexible in the toughest environments. 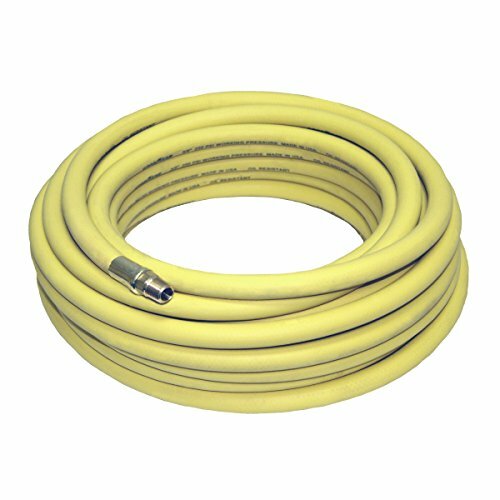 Protected by the abrasion-resistant outer jacket, the internal spiral synthetic yarn reinforces the hose wall, preventing splitting or bubbling at high pressures and temperatures. Only solid brass end fittings are used to ensure tight, leak-free connections. End caps prevent hose damage when not in use. This item is no longer manufactured by Michigan Industrial Tools.